A microtiter plate was coated overnight with various antigens at a concentration of 5 μg/ml. After washing and blocking with PBST + 5% BSA, detection was performed using HRP conjugated Human Anti-Eculizumab Antibody, clone AbD32311_hIgG1 (HCA314), at a concentration of 2 μg/ml in HISPEC Assay Diluent (BUF049A) followed by QuantaBlu Fluorogenic Peroxidase Substrate. A microtiter plate was coated overnight with eculizumab, human IgG4 kappa or human IgG2 kappa at a concentration of 5 μg/ml. After washing and blocking with PBST + 5% BSA, detection was performed using HRP conjugated Human Anti-Eculizumab Antibody, clone AbD32311_hIgG1 (HCA314), titrated to the given concentrations in HISPEC Assay Diluent (BUF049A), and QuantaBlu Fluorogenic Peroxidase Substrate. Data for eculizumab are shown as the mean of three measurements. A microtiter plate was coated overnight with eculizumab at a concentration of 1 μg/ml. After washing and blocking with PBST + 5% BSA, PBST with 10% fetal calf serum was added, spiked with increasing concentrations of Human Anti-Eculizumab Antibody, clone AbD32107_hIgG1 (HCA313, black), clone AbD32311_hIgG1 (HCA314, red), or clone AbD32109_hIgG1 (HCA315, blue). Detection was performed using HRP conjugated eculizumab followed by QuantaBlu Fluorogenic Peroxidase Substrate. HRP conjugation of the eculizumab used in this assay was performed using a LYNX Rapid HRP Conjugation Kit (LNK002P). Data are shown as the mean of three measurements. A microtiter plate was coated overnight with human complement C5 at a concentration of 1 μg/ml. 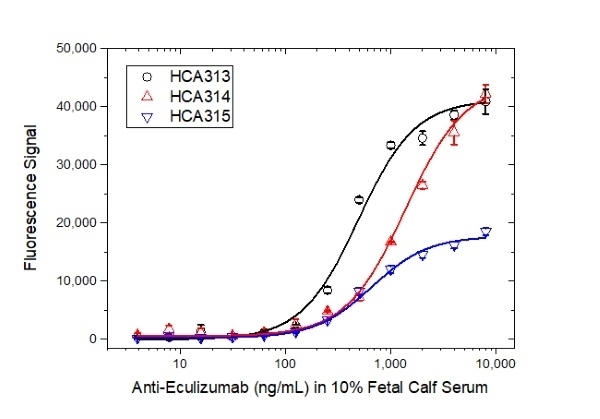 After washing and blocking with PBST + 5% BSA, a pre-incubated mixture of eculizumab (0.3 μg/ml), spiked with increasing concentrations of Human Anti-Eculizumab Antibody, clone AbD32311 (HCA312) was added; HCA312 is the same clone as HCA314, but in monovalent Fab format. Free eculizumab still capable of binding to the human complement C5 coated plate, was detected using Mouse Anti-Human IgG (Fc) CH2 Domain:HRP Antibody (MCA647P) followed by QuantaBlu Fluorogenic Peroxidase Substrate. Data are shown as the mean of three measurements. Human Anti-Eculizumab Antibody is a recombinant, inhibitory, anti-idiotypic antibody in IgG1 format for use in immunogenicity testing. It can be used as a positive control or calibrator in an anti-drug antibody assay. Human Anti-Eculizumab Antibody, clone AbD32311_hIgG1 is a paratope specific, inhibitory anti-idiotypic antibody that specifically recognizes the free humanized monoclonal antibody eculizumab. It does not recognize free human complement C5 or eculizumab in complex with C5. Clone AbD32311_hIgG1 is a fully human recombinant monoclonal antibody with IgG1 isotype and is suitable as a surrogate positive control or calibrator in an anti-drug antibody (ADA) assay as part of eculizumab or biosimilar immunogenicity testing. Eculizumab (Soliris) is a humanized IgG2/4 kappa antibody. The heavy chains are comprised of human IgG2 sequences in CH1, the hinge and the adjacent portion CH2, and human IgG4 sequences in the remaining part of CH2 and CH3. The drug is used to treat paroxysmal nocturnal hemoglobinuria (PNH), a rare acquired life-threatening disease of the blood characterized by destruction of red blood cells by the complement system. It also has approval as an orphan drug for treatment of atypical hemolytic uremic syndrome (aHUS). Eculizumab specifically binds to the terminal complement component 5 (C5) and inhibits the cleavage of C5 to C5a and C5b by the C5 convertase, which prevents the generation of the terminal complement complex C5b-9. Both C5a and C5b-9 cause the terminal complement-mediated events that are characteristic of PNH and aHUS. 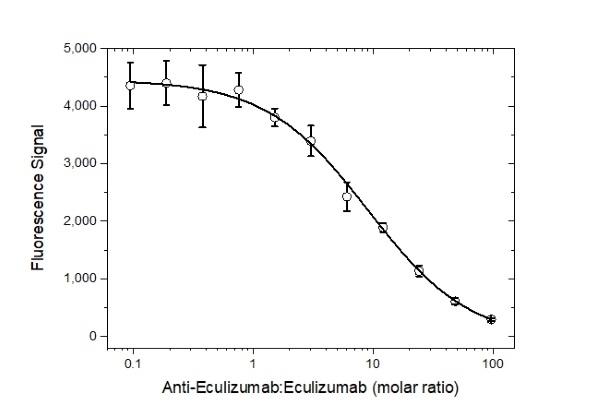 A 1:1 molar ratio of eculizumab to C5 is sufficient for C5 inhibition. 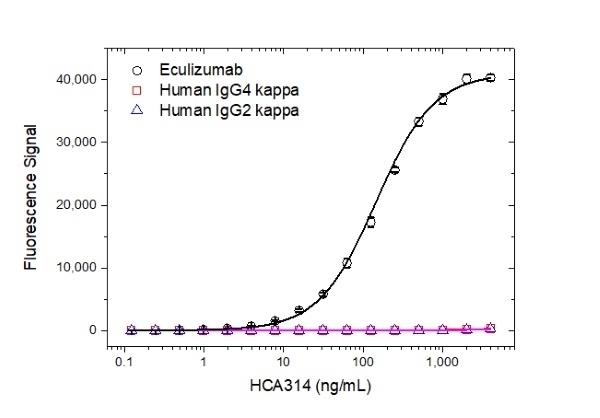 The monovalent intrinsic affinity of AbD32311_hIgG1 was measured as KD = 6 nM by real time, label free molecular interaction analysis on immobilized eculizumab. Soliris is a trademark of Alexion Pharmaceuticals, Inc.
Clone AbD32311_hIgG1 can be used in an indirect ELISA. It can also be used as a surrogate positive control or calibrator in an anti-drug antibody assay.